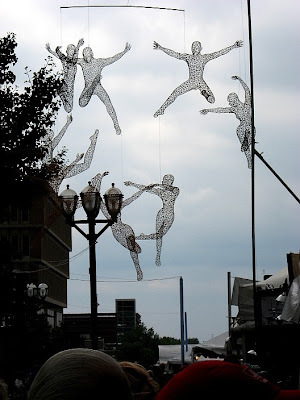 Wire Sculptures From Around The World. 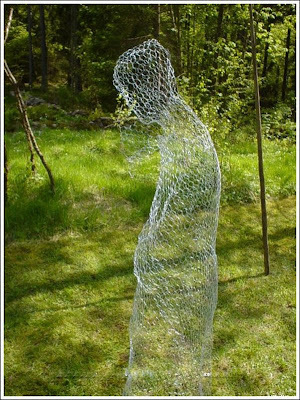 Collection of ‘Wire Sculptures From Around The World’ from all over the world. 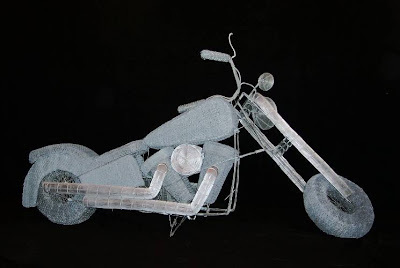 Wire Sculpture By Derek Kinzett: Wire sculptor artist, Derek Kinzett's work looks simply incredible. 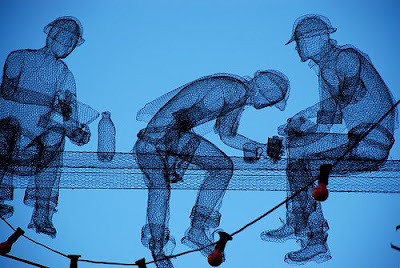 It's amazing that he can work the wire in such a manner and the figures are so life like. 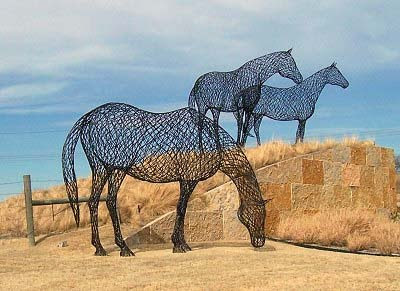 Wire Horses: These contemporary wire sculptures graze in Austin Ranch just north of Dallas, created by Lucy Billingsly. 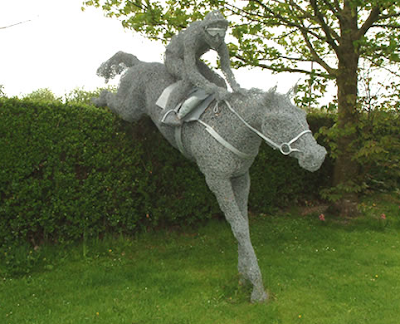 Wire Sculpture By Helen: Helen Godfrey's wire figures made from durable galvanized wire mesh looks fabulous in any landscape or garden. 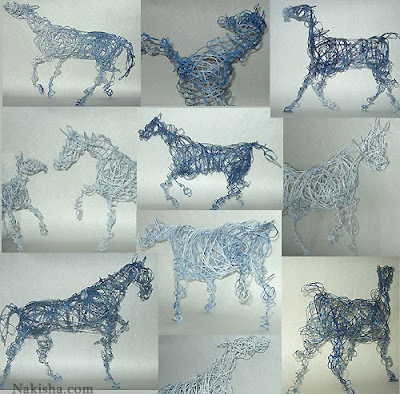 "Blue Horse Series" Sculptures: These are made from a single strand of wire, wrapped individually by hand and that makes no two alike. 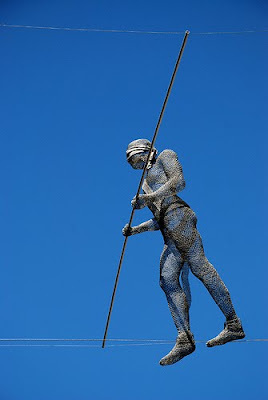 "Paint is applied so some of the original wire shows at different angles which adds to the dynamic effect of light on the wire." 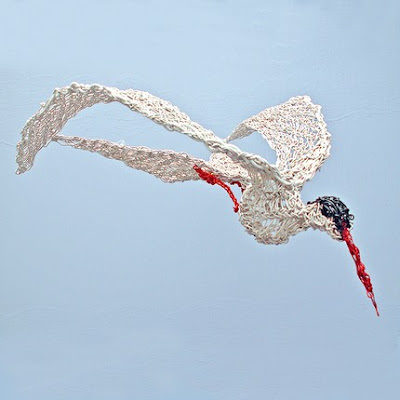 Wire Sculpture By Lisa Van Herik: She has explored and created many woven wire techniques in the past 20 years. 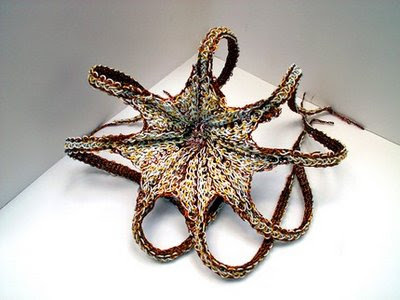 And she has also written two books on the subject: Make Wire Beads and second book on combining fiber and wire, Fiberwire Beads and Jewelry. 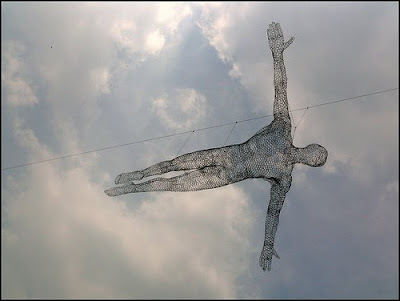 Rupert Till's Wire Sculptures: This life-size figures is the handiwork of British sculptor Rupert Till. 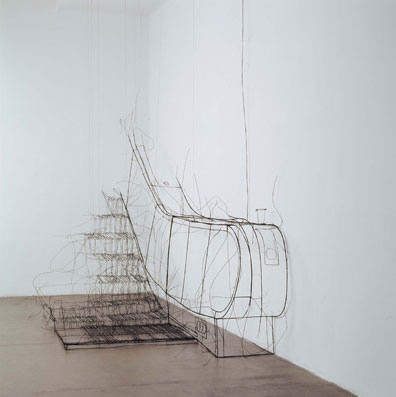 Escalator Wire Frame Sculpture: A wire sculpture of an escalator by Fritz Panzer. 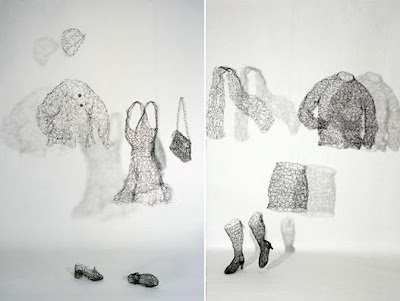 Wire Sculpture by Karen Searle: "Essence Installation Detail, Jacket, Dress; Crocheted and hand-manipulated steel wire; life-sized." 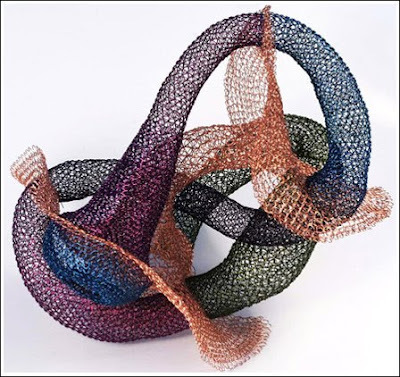 Wire Art By Sonny Rolle: This Rhode Island artist's work is quite impressive, these are made from strands of flexible, coated wire. 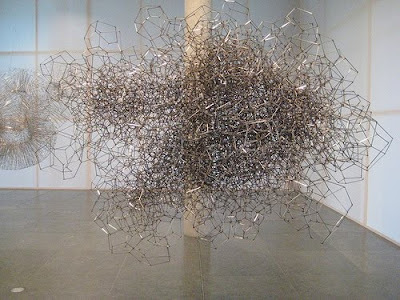 Wireframe Of Toyota Corolla Sculpture By Benedict Radcliffe: British artist Benedict Radcliffe created this amazing, full-scale sculpture of a Toyota Corolla which was rendered entirely using wire. It looks like a CGI, but it's real. 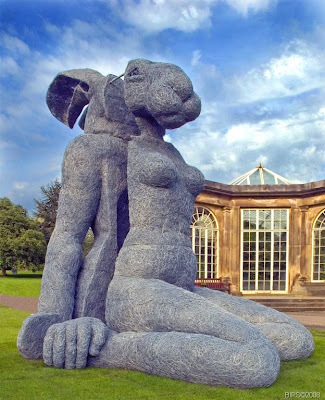 Wire Sculpture By Sophie Ryder: Sitting Lady Hare, a galvanized wire sculpture at Yorkshire Sculpture Park by Sophie Ryder. 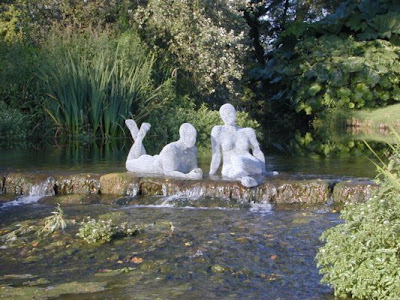 Eye in the Sky: Another one by Sophie Ryder at the Yorkshire Sculpture Park. 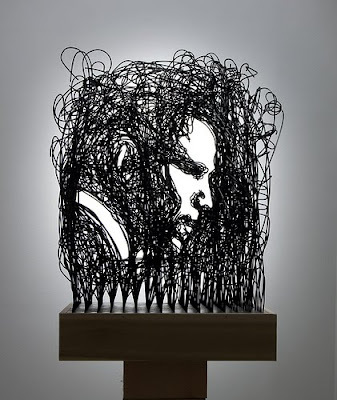 Portrait: Measures 2'x2'x9', created using 1000 feet of wire, black enamel and poplar base. 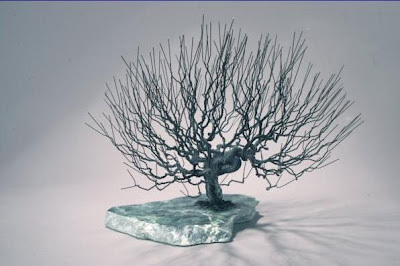 Natural Tree Wire Sculpture: Created by Mark Golomb. 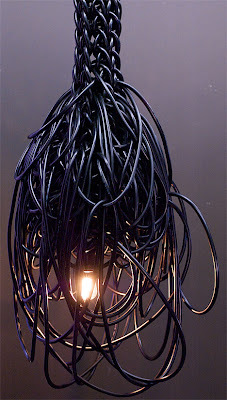 Tangled Electric Wire By Kwangho Lee: We couldn't miss this one. 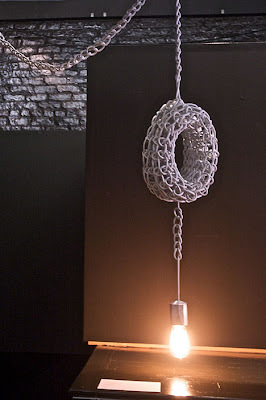 Designer Kwangho Lee has been making these lamps for more than three years now. 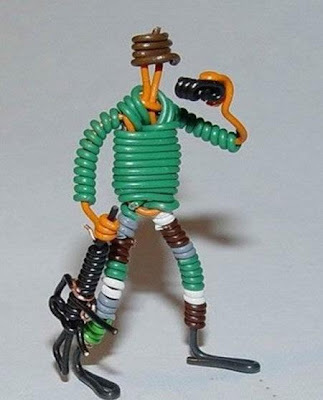 "His initial idea was simple, to turn the lamp inside-out, getting rid of the lamp shade and body, keeping only the essentials, thus exposing the customary hidden wires." Modern and Cool Bathroom and Kitchen Tiles. 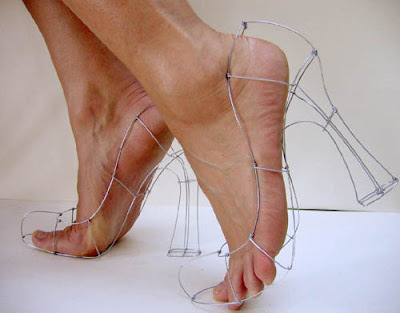 Customizable Clothing: Five Interesting Options. 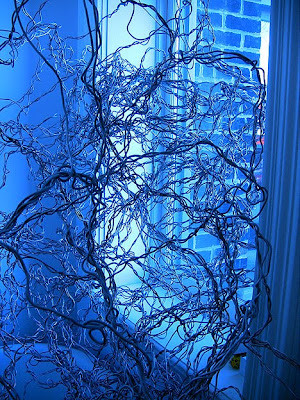 Cool and Creative Hidden Safes. 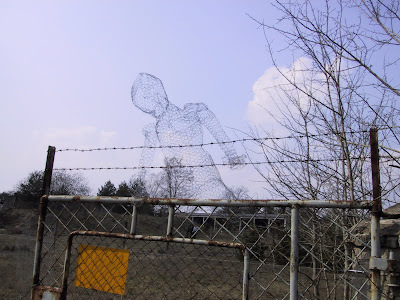 Camouflage Artwork By Liu Bolin. 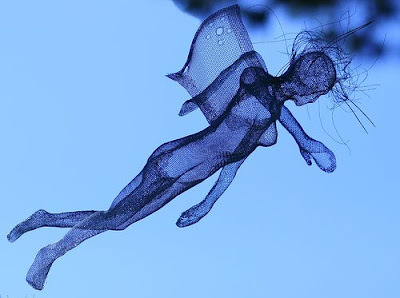 20 Cool and Modern Hammock Designs. Cool and Creative Sleeping Bags.